It’s done! 1 week of hard work, visiting several restaurants, cafés and homes later I can finally show you what I and my Iranian friends have been working on so hard. 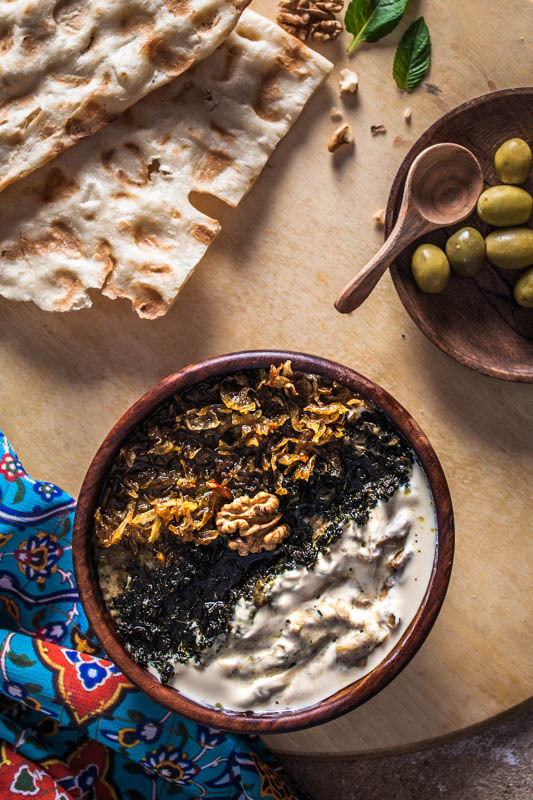 I wanted to create a food photography series about Traditional Iranian food and I (we) couldn’t be happier with the results. Not only is the way to a man’s heart through his stomach. In the same way is the culinary path one of the best ways to get to know a land and its compatriots. You may visit the oldest buildings, spend hours and hours in museums and galleries but nothing will get you as close to a culture and its people than sitting on a kitchen table with a Persian family devouring Mama’s best homemade meals or walking over a buzzing bazaar and being seduced by the variety of smells and foreign looking delicacies. Cooking and food has been around for quite a while (it’s basically of vital importance) and is therefore a great conservator of history, memories and emotions. Even more so. Food is a universal language that everyone can understand. Shapes, tastes, smells, textures – everyone will have an opinion and be able to recognize differences whether they’ll be positive or negative. Furthermore it does not only come down to cultural differences of various countries only. Food is so much more minute and also depicts the niceties that separate the respective regions of a country from each other. 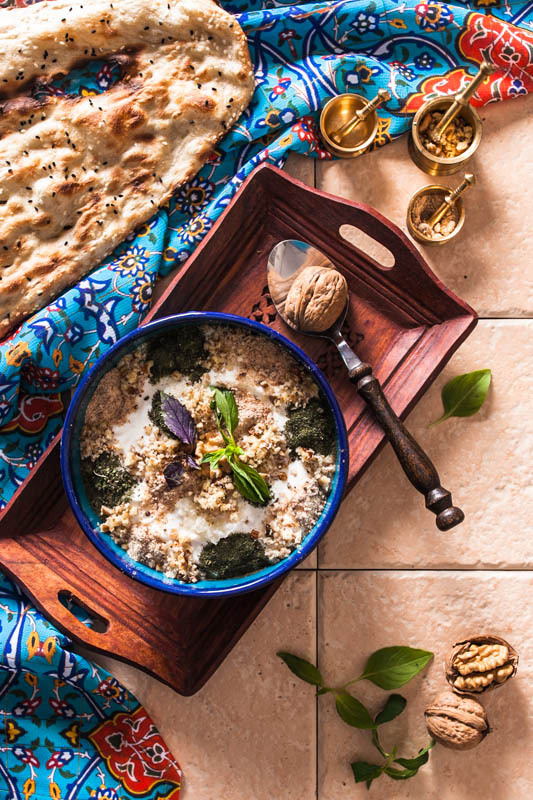 This is why we created this series about traditional Iranian food, focusing mainly on the most popular as well as most traditional or ‘uncommon’ (compared to the German culture) food examples. 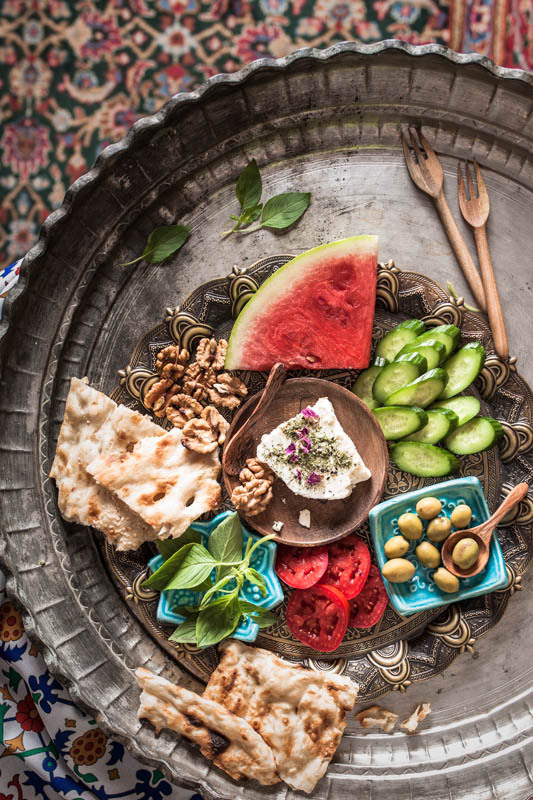 Instead of showing the food only we decided to style the food in a light and vivid environment with items that represent the Iranian culture even more, such as traditional table ware, old fabrics and even managed to add a hint of blue – the traditional Iranian blue – into each photo. 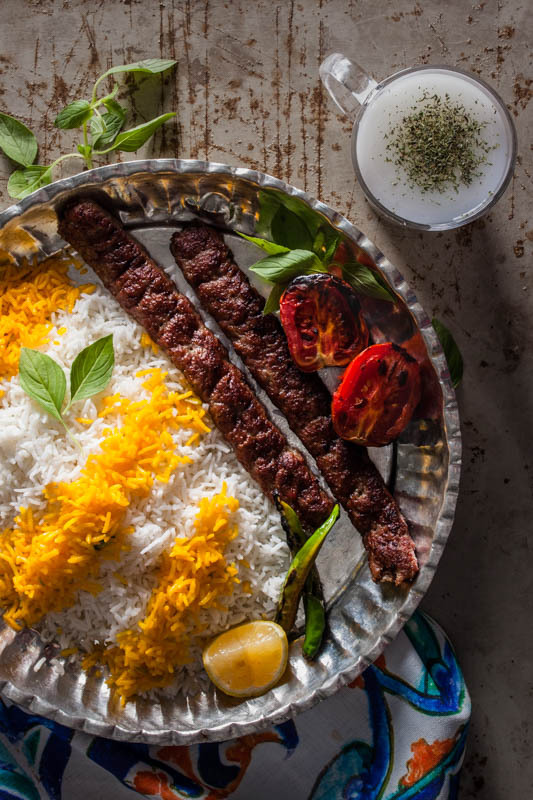 Kebab is the most common food you can find all over Iran. It’s usually served with rice or bread and basil. Doogh is a refreshing dairy drink usually made with yogurt, water and mint. The taste may vary from salty to sour, depending on where and from whom you drink it. 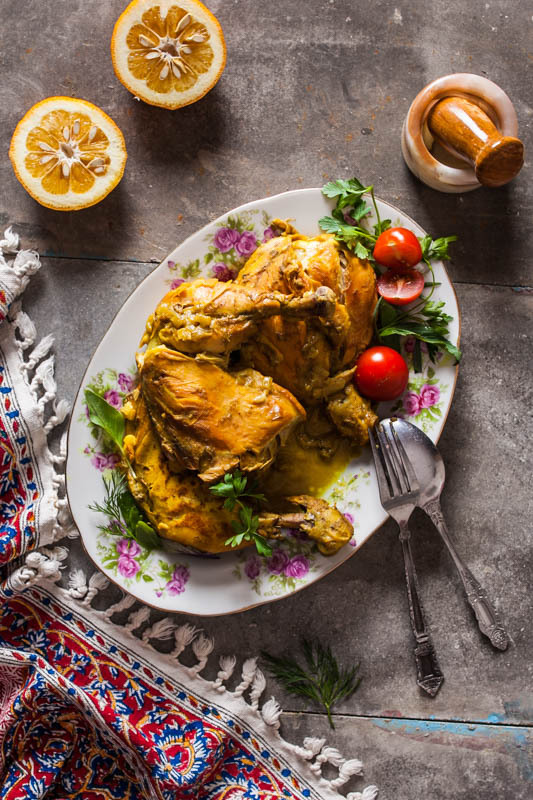 Right after kebab comes the chicken served with rice and sweet barberries. You can find it at every takeaway and restaurant. The barberries are cooked with saffron, sugar and oil. Saffron is one of the most used spices in the Iranian cuisine. 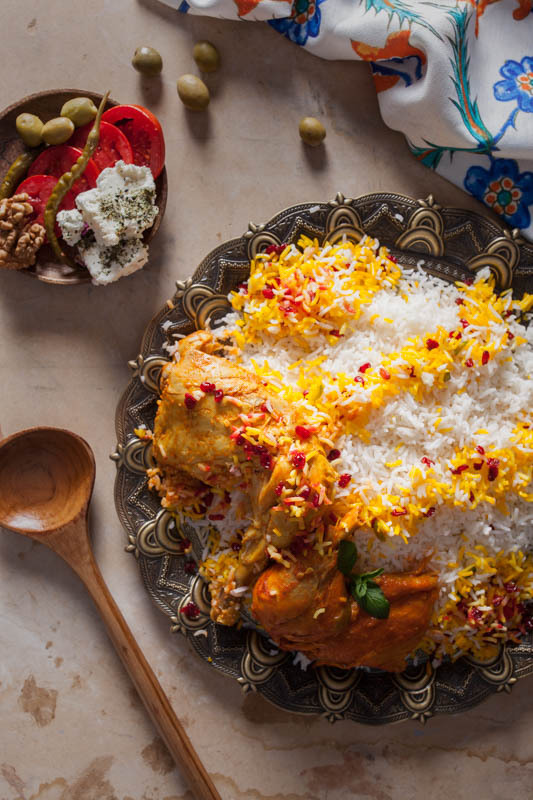 Combined with chicken it’s another very popular Persian dish. The most common way rice is prepared in Iran. Slices of potatoes are placed on the bottom of a pot and covered with pre-boiled rice. It then is cooked until potatoes and rice build a golden crust (which is the tastiest part of this meal). 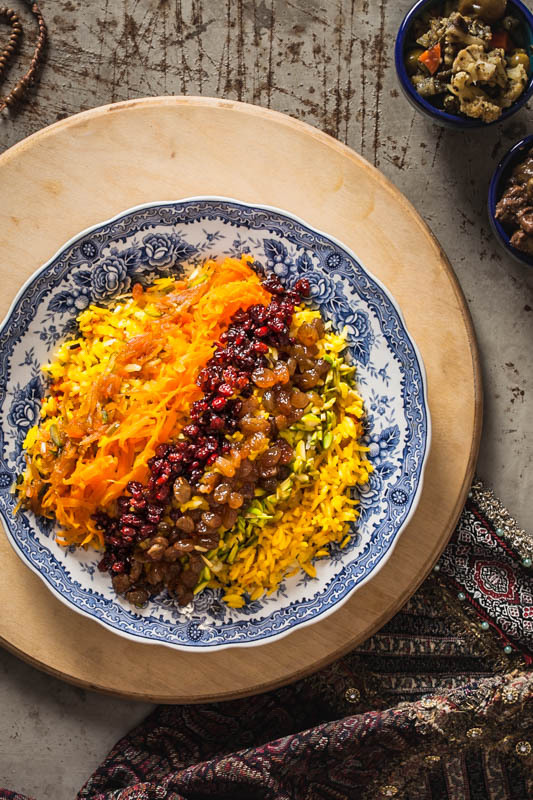 Morassa polo is a sweet saffron rice dish prepared with orange skin, raisins, almonds, pistachios, carrots and barberries. It is mostly served as a side to savoury meat. 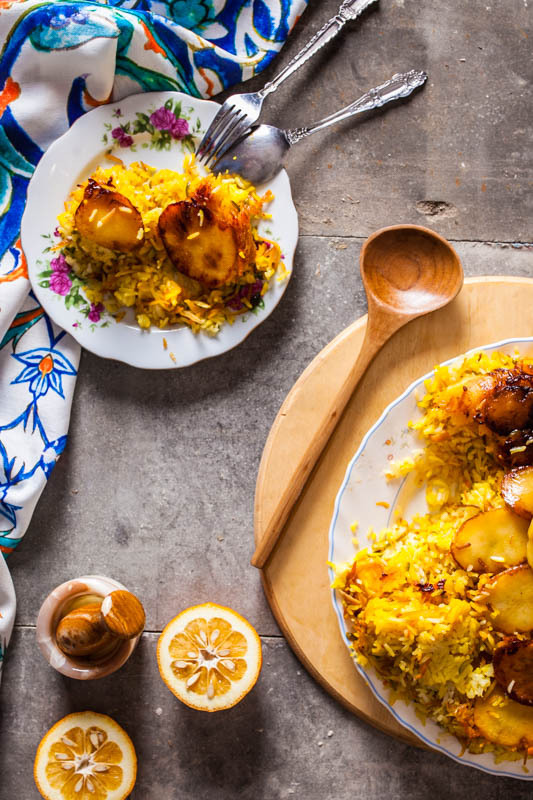 It serves a more festive purpose and is not as ordinary as polo ba tahdig sibzamini. 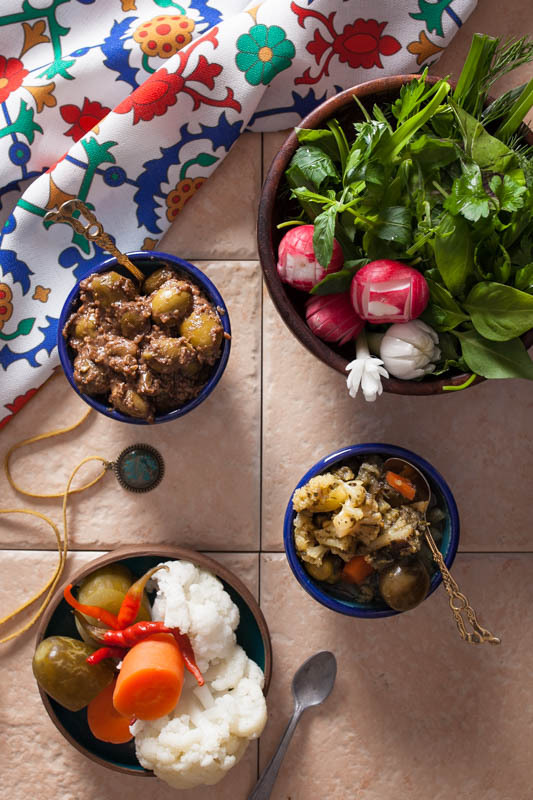 Sabzi khordan are mixed herbs, radishes, onions and the like that are basically served with every meal. 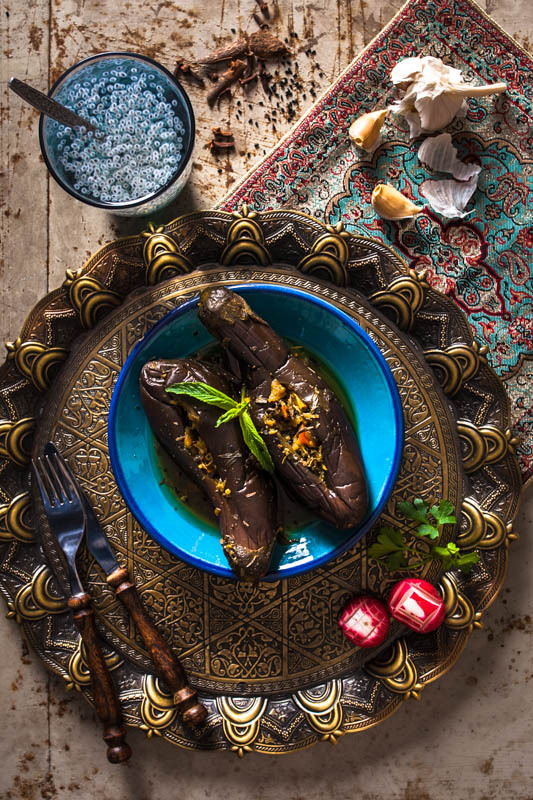 Zeytoon parvarde are olives mixed with a pomegranate sauce and walnuts. 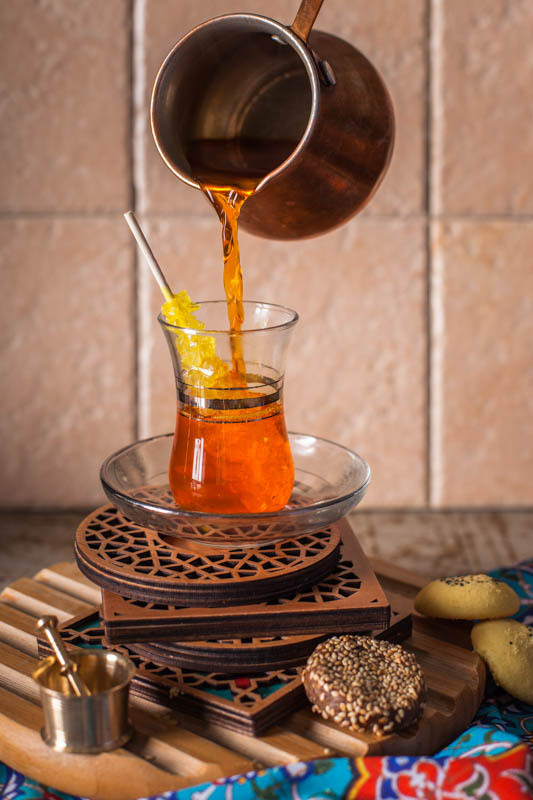 It’s a traditional side from the Northern part of Iran. Shoor is the general term for pickled vegetables. Iranians pickle everything! Shoor is the salty version, while torshie makhloot has a sour taste. A savoury, garlicky yogurt side with different kinds of herbs served to all kinds of dishes. A starter based on curd, egg plant and garlic topped with (deep) fried ground mint and onions. Served with bread. 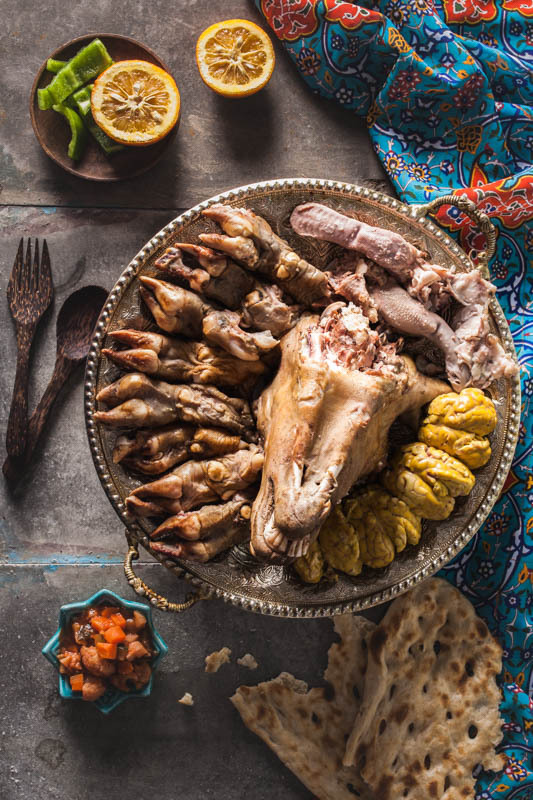 Another very delicious starter from the North of Iran. Egg plant is mixed with tomatoes, garlic and egg and then served with bread. A sour starter. Egg plant is pickled and then stuffed with more pickled vegetables. I told you Iranians love pickled stuff. Mixed fruits are served with heavy cream, different jams and honey and (of course) some bread. 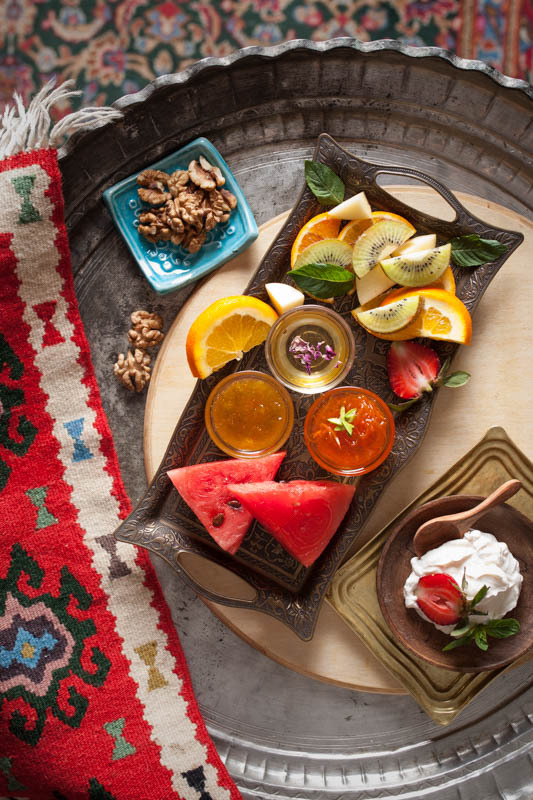 A simple Iranian breakfast consists of cream cheese (tabrizi cheese), tomatoes, cucumber, bread, walnuts and melon (if it’s in season). If you ever come to Iran, you won’t get around this. 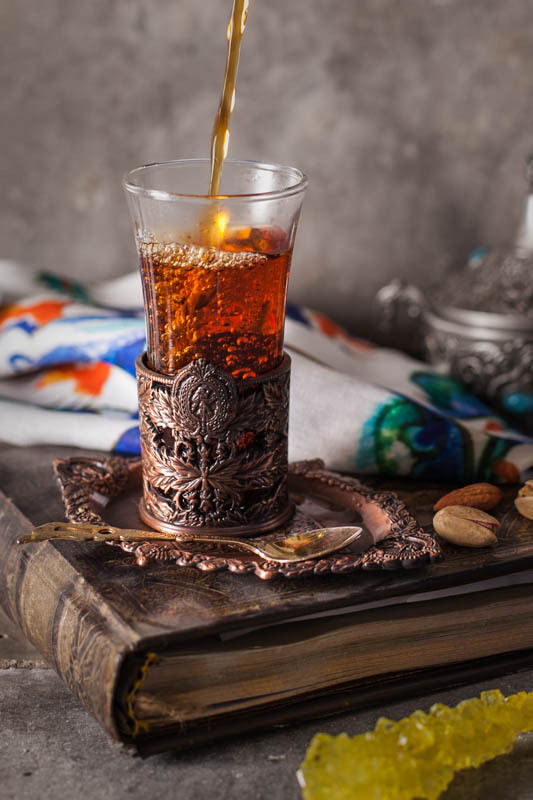 Iranians drink this black tea All. The. Time. Those purple flowers have a very soft taste and calm you down, which is why it’s usually drunk in the evenings. If you add lemon this purple tea will turn red. This tea is favourably served for special occasions, e.g. for family parties. It’s supposed to cheer up your mood and make you more happy. 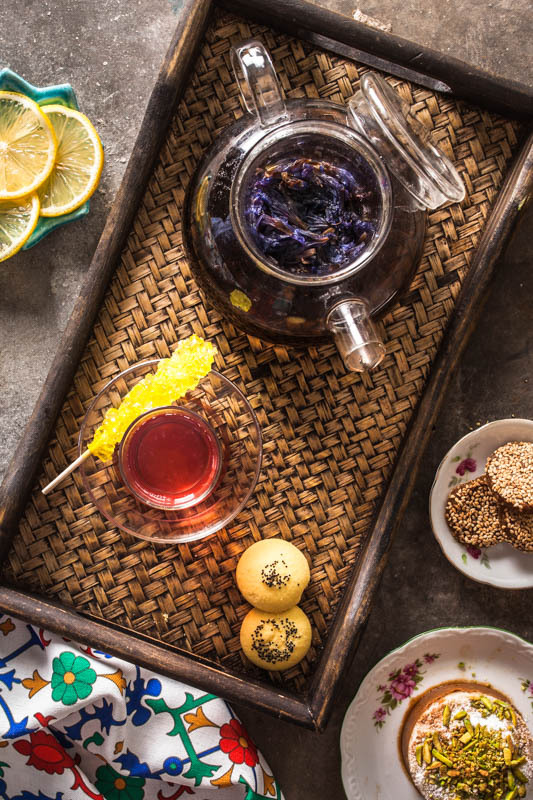 Iranians love to serve sweets with their tea. 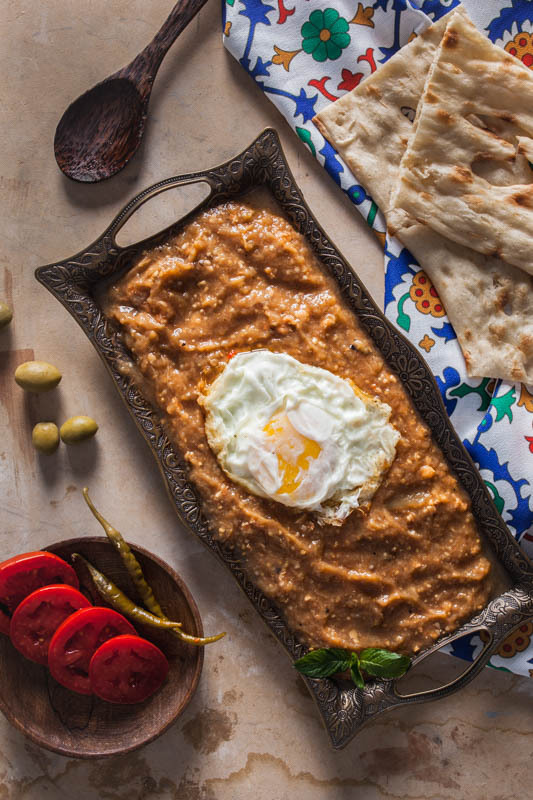 Against all expectations Kalle Pache, an Iranian delicacy is eaten early in the morning for breakfast. It’s a very fatty and heavy dish and therefore consumed only once every week. It consists of the brain, eyes, tongue, ears and legs of a sheep. Another way of eating it is soaking bread in oil and the broth the sheep was boiled in over night – like a soup. I gave Kalle Pache a try after photographing it and must say it won’t become my favourite dish of all times. The brain was simply a fatty, wobbly mass, the tongue and eyes however were quite okay, the leg was too gristly for my taste. While this experience might have been a little uncommon it was definitely not gross or anything like that. I personally found the dish way too salty and overcooked – it was just not my taste. Yet, when you eat meat I am of the opinion that ALL parts of an animal should be used and not just what seems ‘appealing’ to our limited point of view. Thanks for reading, sharing and liking this post. 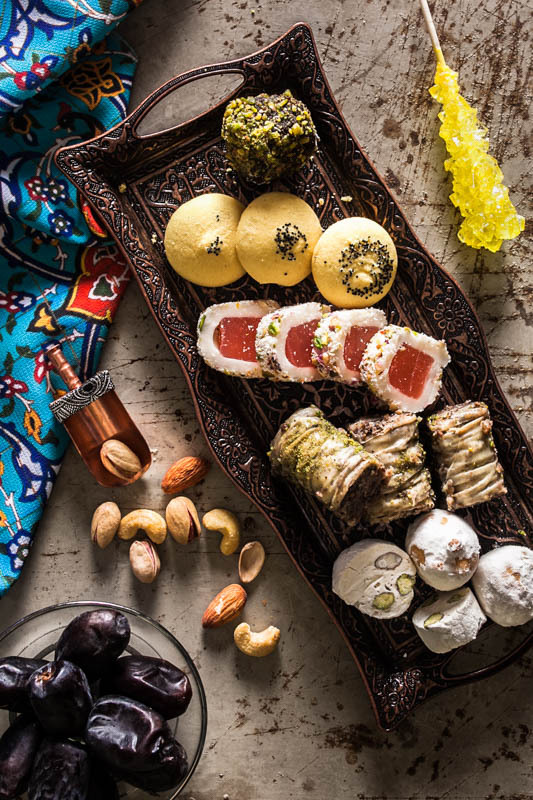 This food photography project was realized by myself, Arezou Babadi and Mina Abbaspanah in Tehran, Iran with the help of the DAAD who funded the TWO Cities workshop and exchange of the Dortmund University of Applied Sciences and Arts and the Tehran Art University. If you’re interested in a more detailed behind the scenes post let me know in the comments below. Info & Transparency | Links marked with an *asterisk are so called affiliate-links! If you buy a product via this link you support me and my work on this blog with a small commission. Obviously this won’t cost you a cent more, but I see it as an appreciation for my work. I will only recommend products and services, which I use myself and with which I am fully satisfied. Great work! This brings back so many memories and I’m glad to see people are experiencing Iran for what it really is. That’s exactly what I want to achieve with this (and following) post. Showing the beauty of a country that is displayed very badly in the Western European News. Such beautiful pictures! It all looks so good! Thank you so much Parisa!